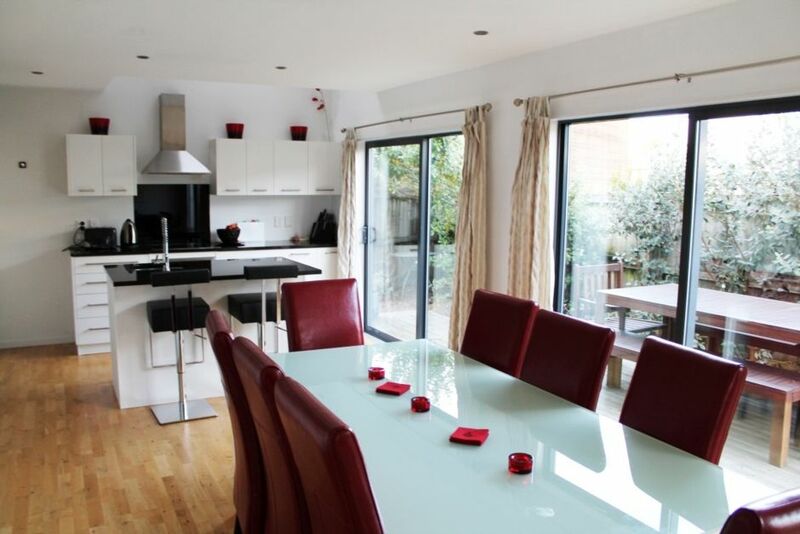 The house is a modern two storey executive townhouse, tastefully furnished throughout. This inviting and well equipped house features a bright, open-plan kitchen / living / dining area with good indoor/outdoor flow which is superb for escaping from the hubbub of the city. The kitchen is fully equipped - assuming that you can resist the numerous local restaurants (within easy walking distance). On warm summer evenings you can relax on the deck or have a BBQ in the garden. The main bathroom with shower over bath is on this floor. Parking is available either on-street or in the garage which is accessible from the house. The garage also has clothes washing/drying/ironing facilities. We have had very positive feedback from both holidaymakers and business people. Whatever your reason for coming to Christchurch, Bartlett By The Park is a welcoming house in a fantastic location. It should be noted that Bartlett Street is a very quiet street and we ask all our guests to respect our neighbours. We have had excellent feedback from previous guests and most of our bookings are from repeat guests. If this house is not available or you have more than 7 people check out listing 35438 for the house next door. Usual minimum booking period is 2 nights. We do take single nights to fill a gap or last minute. 4 night min stay at Christmas and during April School holidays (15-30 April). Single night supplement = $60. Please enquire. We Moved to New Zealand in 2003 and made this beautiful country our home. We hope you enjoy it as much as we do. Bartlett by the Park can't be beaten on location and comfort. There is easy access to the city, shopping, cafes, farmers' market but still have space to relax. Bright, airy townhouse with outdoor deck and garden. Probably more than you need! I love to cook so want the house well stocked for others like me. Well equipped kitchen. Great if you want to stay in and cook from Saturday's Farmers' market. Good location, clean and tidy and great assistance by Joan. Very spacious and great decor. Perfect location, wonderful hosts, lovely place! Bartlett bythe Park is right next to a huge park and the Christchurch Botanic Gardens. It is walking distance from the CBD, tram stops, museums and great restaurants. We were greeted with gingerbread cookies ready to go in the oven and a bowl of fresh fruit. The place is neat and clean and we loved our stay. When we entered, the flowers were lovely and welcoming. It's in a terrific location - the park, gardens, museums, city center and many restaurants were all within walking distance . The cookies ready to bake were a nice touch. The bed in the second bedroom could use a new bed. I am delighted to hear that you enjoyed your stay, the location and the extra touches. I am sorry that the bed did not suit you. We have high quality New Zealand made beds and frequently get great feedback on how comfortable they are. However, we do realise that personal preference for beds is quite subjective. Great place. Great location. Loved the bikes! Fantastic house in perfect location! We recently stayed at the house for a week and it really was a home away from home. It was extremely clean, comfortable, modern and in a quiet street just a five minute walk from Hagley Park and a ten minute walk from the beautiful Botanic Gardens. It's the perfect location to explore the central city and it's also easy to get to the main roads to travel further afield. We did easy day trips to Sumner, Lyttleton and Akaroa and the wonderful Riccarton Farmers Market is a nearby must-visit on a Saturday morning. Supermarkets (Pak n Save and New World) are also close by and the kitchen has everything that you will need. Joan was a wonderful 'remote' host. We arrived at the house to find some delicious ready-to-bake biscuits and a welcome note. We didn't need anything during our stay but felt that she would have been easy to contact if there were any issues. Highly recommend and will definitely book again for our next Christchurch visit! The house was exactly as described and shown on the website. It was well equipped and had everything my wife needed. The house was in a great location; the area was quiet, easy to access via car, close to (food) shops / restaurants and an easy and pleasant walk through the park to reach the city centre. * Hagley park is home to the botanic gardens, golf, cricket and kids playground. * If you are lucky enough to be here on a Saturday head for Riccarton Bush Farmers Market for foodie treats. It should be noted that Bartlett Street is a quiet street and we ask all our guests to respect our neighbours.